Annus horribilis: has a year of severe fiscal pressures ended with an economic slump? Prime Minister Peter O’Neill assured Papua New Guineans last year that our country was not in a recession (see here). However, does the O’Neill Government’s own official statistics from the 2017 National Budget unwittingly support the view that Papua New Guinea experienced an economic contraction in 2016? This is troubling as not only could the total size of our economy have shrunk in real terms but when our fast growing population is taken in account this negative real economic growth has far reaching adverse implications as the fall in real income per person is even greater. Last year was a challenging year financially for Papua New Guineans. Anecdotal evidence suggests that many businesses have had falling sales and their profit levels and margins have been squeezed. Some businesses have been forced to trim costs by reducing the size of their workforce. Businesses too have been holding back on investments while trying to ride out the economic turbulence created by PNG’s falling terms of trade and the foreign exchange rationing by Bank of Papua New Guinea. The O’Neill Government’s 2016 revenue budget has struggled to perform to the level expected by the Government supporting the view that economic conditions have grown tougher and that last year was one of real financial difficulty for many. The O’Neill’ Government’s has admitted (see here) that it had cash flow difficulties; this has imparted considerable pressure on Government operations with many public sector agencies not receiving monthly budget funding and the build-up of arrears causing liquidity problems for businesses providing goods and service to the government. Whilst trying to understand the O’Neill Government’s economic growth projections in Volume 1 (see here) of the 2017 National Budget Papers (simply “Volume 1” from now on) I computed a curious result using only the official statistics that suggested that 2016 may indeed be a period of negative economic growth interrupting 14 years of positive growth. There is a lot more detail and complicated methodology behind GDP statistics but simplifying it considerably – if you wish to compute real GDP indirectly you need two pieces of information: (1) nominal GDP and (2) some measures of economy-wide prices (or the GDP deflator). In fact, from equation (1) you only need any two pieces of information and you can work out the third statistic. I will take advantage of this in my simple analysis. From Table 1 of Appendix 3 in Volume 1, I’ve extracted a summary of these two measures with an explanation of how you can use equation (1) to compute real GDP and consequently real economic growth; this is shown in Exhibit A. Real GDP growth is simply the percentage change in real GDP levels in one year compared to the immediate past year. 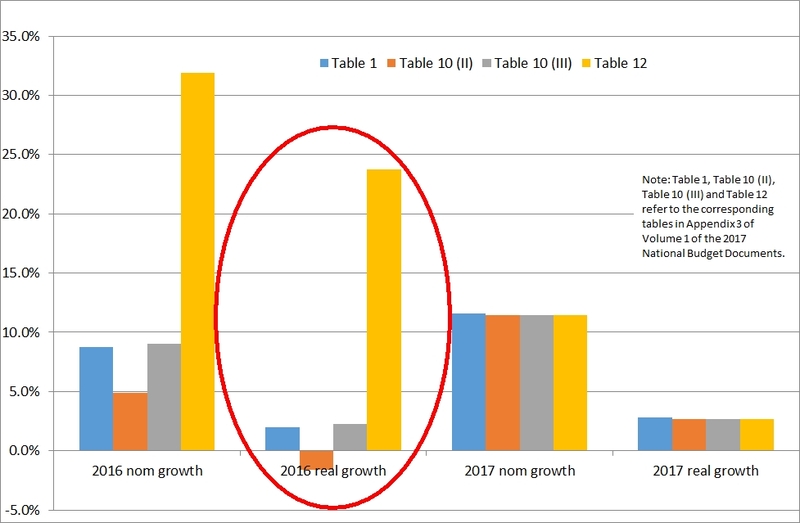 The economic growth estimates for 2016 and 2017 are shown in Exhibit A, and these were taken to National Parliament last November by the Treasurer, Patrick Pruaitch, when the 2017 National Budget was approved. However, the different nominal GDP numbers presented in the 2017 National Budget leads one to question if the estimates of real economic growth shown in Exhibit A are credible and whether they should be used by the O’Neill Government at all. Negative economic growth for 2016? In an earlier post on the public debt ratio (see here), I revealed how the O’Neill Government had different current estimates of nominal GDP for years 2015-2016 when it should only have one. The Government had only one series for real GDP but that did not match the numbers Government used for nominal GDP when measuring its compliance with the debt to GDP limit set by law. Using equation 1 (above) I compute the corresponding real GDP for each of the different nominal GDP estimates used by Government. Here I make the assumption that Government has a better measure of price movements for the components of GDP and total GDP so I use the Government’s deflator index [from Volume 1, Appendix 3, Table 1] and the different nominal GDP estimates shown in Volume 1 [namely Appendix 3 – Tables 10(II), 10(III) and 12]. Exhibit 2 shows in graphical form the results I compute for real GDP growth. Exhibit 5 shows the same numerical results but in tabular form. There are no inconsistencies with the 2017 nominal and computed real growth numbers. However, there are striking differences between the O’Neill Government’s implied projections for economic growth in 2016. So of the bars circled in red in Exhibit 2, which do we use? I summarize arguments in Exhibit 3 as to why I view the orange bar with an economic contraction as showing a more reliable measure of 2016 economic growth. The Government data that comes from Table 12 of Appendix 3 of Volume 1 (this is shown in the gold bars in Exhibit 2) suggests quite a large 2016 growth that is frankly implausible in current conditions and so this should be viewed with incredulity. However, Table 12 in Appendix 3 of Volume 1 is used to show that the O’Neill Government is complying with the debt limits. If the economic growth estimates derived from the Table 12 dataset are implausible then we should be concerned about the validity of Table 12 and Government compliance with the debt limit set by law. The government data that comes from Table 10 (III) of Appendix 3 of Volume 1 (shown as the grey bars in Exhibit 2) are fairly consistent with Table 1 data (shown as the blue bars in Exhibit 2). However we know that the data in Table 1 of Appendix 3 of Volume 1 are wrong; indeed the O’Neill Government in Volume 1 (on page 55) acknowledges that National Statistical Office has updated the GDP statistics. So to try to apply the growth rates from Table 1 (if incorrect) to another GDP data series would run the risk of presenting misleading and false statistics. The key driver for the differences in the computed 2016 economic growth numbers is the statistic for 2015 GDP (see the top shaded figures in Exhibit 5). The O’Neill Government’s 2017 National Budget presents at least four different statistics for this. The National Statistical Office publicizes on its website (see here) that it has completed the update of the real and nominal GDP statistics for the period 2006-2013 and this was released on 23 March 2016. However, the updated GDP statistics themselves are not available on the National Statistical Office website (at least as of the date of this post 28 January 2017 – the link to the document with the statistics leads instead to a “Not Found” page). So I am guided by the O’Neill Government’s 2016 Mid-Year Fiscal and Economic Outlook report (see here), which advises (on page 1) that that all actual nominal GDP statistics are from National Statistical Office and labels (incorrectly) the 2015 nominal GDP as an actual in Tables 3(II) and 3(III) on pages 33 and 34 respectively. I am also guided by Loi Bakani, the Governor of the Bank of PNG shows in a May 2016 presentation (see slide 7, found here) that the (rebased) nominal GDP statistic for 2015 is K64.162 billion. Extracts from the aforementioned documents from both Department of Treasury and Bank of Papua New Guinea are shown in Exhibit 4. This is the same number that appears in the 2016 Mid-Year Fiscal and Economic Outlook report. This consistency is expected as Bakani, in a recent media released just this last week (see here), states that the “Bank of PNG and the Department of Treasury extrapolated the [National Statistical Office GDP] data to 2021, which was used in the 2017 National Budget”. 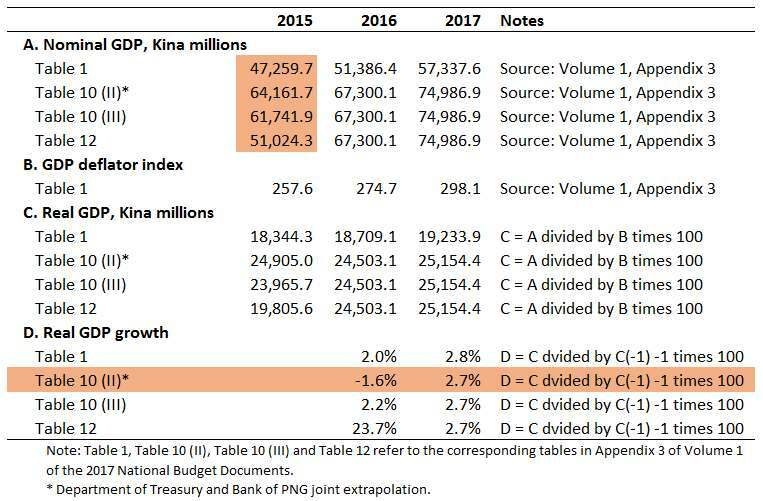 Prime Minister O’Neill assures us ( see here) that the Bank of Papua New Guinea is independent so that gives us great confidence in using BPNG’s 2015 GDP estimate, which is the same as Department of Treasury’s and appears in the 2017 National Budget [Table 10(II) of Appendix 3 of Volume 1]. Using information from the 2016 Mid-Year Fiscal and Economic Outlook report and the Bank of Papua New Guinea presentation leads us to conclude that the data series shown by the orange bars in Exhibit 2 are the most reliable statistics to use. In Exhibit 5 I show the data I have used for nominal GDP and the GDP deflator and the results of my calculations. All the data used in Exhibit 5 comes from the O’Neill Government’s official budget documents, namely Volume 1 of the 2017 National Budget Papers. Exhibit 5 shows that the O’Neill Government’s own data suggests that in 2016 the economy could have contracted by 1.6%. This will be an extraordinary economic slump that could have quite severe implications for our people, not only the rural based majority but those in urban areas with limited skills and opportunities to pursue cash income generation in the formal sector and even more limited ability to rely on subsistence farming. 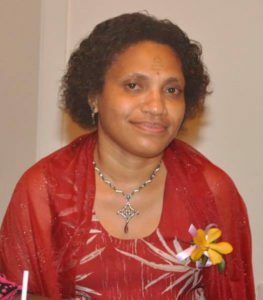 With increasing international attention focused on Papua New Guinea in the run up to the 2018 APEC Leaders’ Summit, the O’Neill Government must not allow both its and our country’s credibility to come under scrutiny as a result of the poor quality of its key budget policy documents and decisions. I make clear that there is no suggestion on my part that the O’Neill Government has “cooked the books” to create the illusion of compliance with statutory debt limits but the danger is that this perception will arise if the Government doesn’t quickly move to address the deficiencies revealed in this and my earlier posts with its yearly GDP estimates. There is also a risk that the perception may arise that the rebasing of nominal GDP accounts by National Statistical Office was done for political expediency as it increased nominal GDP substantially and thus saved the O’Neill Government from taking much harder, but much needed, decisions to cut and reshape the expenditure budget in order to stay within the law imposed debt limit. This concern may be partly addressed if National Statistical Office releases immediately to the public on its website the full set of updated and expanded national income accounts it says it completed last year. Did our country have negative economic growth of 1.6% last year? It seems reasonable to conjecture that the large cuts to the 2016 expenditure budget have hurt both public sector operations, and private sector companies that provide goods and services to government; this has contributed to falling real GDP and national income. It is a shame that this Parliament that started on a much stronger fiscal and economic position will leave a difficult budget and economic position to a new Parliament to deal with. If our Sovereign Wealth Fund was established and operating as intended or some of the large revenue inflows from prior years saved in some other way then the difficulties of the commodity prices drop and international reserve pressures could have been better contained. The question will inevitably arise as to whether the difficulties experienced in 2016 could have been managed better by the O’Neill Government. If Prime Minister Peter O’Neill assured us last year that our country was not in a recession (see here) why does his Government’s 2017 National Budget appear to contradict his declaration? ← Who actually pays for the PNG LNG royalty and project development levy benefits?